On October,12 2017 Central Bank announced that new 200 and 2000 ruble banknotes will be put into circulation in December, 2017. Design of new banknotes was chosen through a popular vote. 200 ruble note features a view of Sevastopol with sunken ships on one side and Chersonesus on the other. After a popular song by a Russian band Mumiy Troll "Vladivostok 2000" Russky Bridge in Vladivostok is printed on one side of 2000 ruble note, the other side has a picture on Vostochny Cosmodrome in Amur region. Banknotes' front side has a QR code wich leads to the Central bank webpage with actual information on note's design and anti-counterfeiting details. 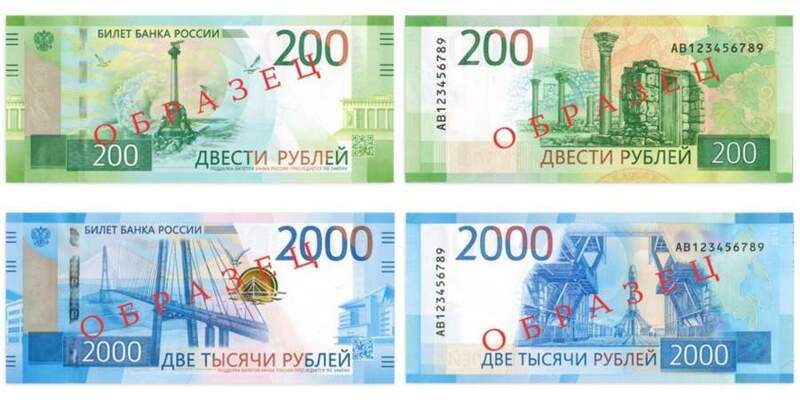 New banknotes will be first launched in regiones, depicted on 200 and 2000 rouble notes, Crimea and Far East and in Moscow.